Whether Court can adjourn hearing on Anticipatory Bail application ? Before :- Mridula Bhatkar, J.
Anticipatory Bail Application No. 541 of 2014. D/d. 08.05.2014. For the Appellants :- A.H.H. Ponda a/w Sujay Kantawala i/b Devesh Diwakar Tripathi, Advocates. For the Respondent/State :- Y.S. Shinde, APP. Mridula Bhatkar, J. - The learned Sessions Judge of Greater Mumbai, pending hearing of Anticipatory Bail Application before it, refused to grant interim protection by its order dated 19th April, 2014. Hence, this application is preferred seeking interim bail, till the final decision on the Anticipatory Bail Application 754 of 2014, which is pending before the learned Sessions Judge. "When an application for anticipatory bail under section 438 is preferred, the Sessions Court or the High Court shall either reject the said application forthwith or issue an interim order in respect of anticipatory bail. No third option is open to the Court to adjourn the application without granting any interim relief to the applicant/accused". Whether the Sessions Court or the High Court, while entertaining an application for anticipatory bail under section 438 of the Code of Criminal Procedure, has a power to adjourn the said application without granting interim protection in favour of the applicant/accused or not? (iv) the possibility of the applicant, if granted anticipatory bail, fleeing from justice, either reject the application forth with or issue an interim order for the grant of anticipatory bail: Provided that where the High Court or, as the case may be, the Court of Session, has not passed any interim order under this sub-section or has rejected the application for grant of anticipatory bail, it shall be open to an officer in charge of a police station to arrest, without warrant the applicant on the basis of the accusation apprehended in such application. (iv) Such other conditions as may be imposed under subsection (3) of section 437 as if the bail was granted under that section. (3) Where the court grants an interim order under subsection (1), it shall forthwith cause a notice, being not less than seven days notice, together with a copy of such order to be served on the Public Prosecutor and the Commissioner of Police, or as the case may be, the concerned Superintendent of police. With a view to give the Public Prosecutor a reasonable opportunity of being heard when the application shall be finally heard by the Court. (4) The presence of the applicant seeking anticipatory bail shall be obligatory, at the time of final hearing of the application and passing of final order by the court, if on an application made to it by the Public Prosecutor, the court considers such presence necessary in the interest of justice. (5) On the date indicated in the interim order under subsection (2), the court shall hear the Public Prosecutor and the applicant and after due consideration of their contentions, it may either confirm, modify or cancel the interim order made under subsection (1)." 5. The learned Counsel for the applicant/accused has submitted that the language used in section 438 (1) specifying powers given to the Court is imperative. After sub-clause (iv) of section 438(1), the words used are "either reject the application forthwith or issue an interim order for the grant of anticipatory bail". Use of words "either" "or" give only two options to the judge and it closes the third option to adjourn the matter without passing any order. Therefore, when the application is submitted, the Court needs either to reject it forthwith after considering the merit of the matter or shall grant interim relief to the applicant. He submitted the words "Court may" which is used above subsection (i) of section 438(1)(i) is to be read as "shall". Considering the object of granting interim power to the Court, there is no other interpretation available but to accept this. The purpose of this provision is to protect freedom of an individual which is very valuable. He submitted that sub-clauses (ii) and (iii) lay down the steps that the Courts are required to take when interim order is passed. Certain conditions are required to be imposed in the order and so also as per subsection (3), the Court shall forthwith cause a notice of not less than 7 days to the Public Prosecutor and the Commissioner of Police to be given a reasonable opportunity, when the application shall be finally heard by the Court. This shows that grant of interim bail is obligatory for a Judge, if at all he is not inclined to reject the said application. 6. While buttressing submissions the Counsel referred to the recommendations of the Law Commission, 203rd report, December 2007 on section 438 of the Code of Criminal Procedure. He relied on Chapter 3 which says about Legislative Changes, especially point No.3.3, sub-clause 2, wherein the effect of the proposed amendment to section 438 was mentioned. Sub-clause (ii) reads as under: (ii) if the Court does not reject the application for the grant of anticipatory bail, and makes an interim order of bail, it should, forthwith give notice to the public prosecutor or Government Advocate. The question of bail would then be re-examined in the light of the respective contentions of the parties; and" He referred to Chapter 6 - Analysis of the Amended Law and Conclusions - especially, clause 6.1.8 thereof, wherein the Law Commission has taken a note that the Courts, as a matter of practice, ordinarily pass interim order in the first instance and then the same is confirmed or recalled or canceled after hearing the Public Prosecutor. He argued, the proviso to section 438(i) which states that where interim bail order is not passed and the application for anticipatory bail is rejected, then, it shall be open to the officer in charge to arrest the accused without warrant. This proviso is an explanation of the two options given by the Code to the Court either to grant interim relief or to reject the application. The learned Counsel submitted that the crux of the arguments is that the proviso is not a rider to section 438(i) and does not create a third possibility of keeping the matter pending without passing any order. In support of the submissions, he relied on clause 6.2.10 wherein the Law Commission has stated that the "proviso is more of clarification nature and it is not by way of exception to subsection (i) of section 438. It only seeks to clarify whether there is any embargo on the police power to arrest the applicant/petitioner on whose Anticipatory Bail Application, either no interim order has been passed or whose application for direction under subsection (1) has been rejected. The proviso declares that there will not be any embargo and it will be open to the police to arrest such a person, if such an arrest is otherwise considered necessary in a given case. The proviso, however, does not say that the police must necessarily arrest the person in the situation envisaged therein." 8. The learned APP and the learned Counsel for the Complainant have opposed the application and it was argued that in some offences when short notice of a day is given to the Prosecutor and it is not possible to contact and get instructions from the concerned Investigating Officer, then grant of interim protection to the accused in serious cases will amount to miscarriage of justice and may hamper investigation to a great extent. It may cause tampering or destruction of the evidence and, therefore, the power of the Court to adjourn the matter without either granting anticipatory bail or rejecting the same forthwith is not taken away under the section and the Court can simply adjourn the application for pre-arrest bail without either rejecting or granting interim relief. 9. The object and spirit of section 438 is to protect the liberty of an individual, who is falsely implicated or who is forced to face the disgrace. The section is very precious as it safeguards the freedom of an individual against the unwarranted arrest. It is a unique provision. These are the extra-ordinary powers given to the Court against the warrant and therefore they are to be used cautiously. The application for anticipatory bail is required to be disposed of without any delay. When the application is filed, the Court needs to be quick in taking decision. When it is a very bad case for the accused and his custodial interrogation is a must for investigation, the Court shall reject the anticipatory bail forthwith. After going through the application, the Court may find that involvement of the applicant/accused may be false or the offence was not so grave and without his custody, investigation may proceed, may grant interim bail and fix the application for final disposal. Thus, the verb i.e., "Court may" cannot be disjuncted from the phrase "either reject.....". The verb "may" gives discretion to the Court to pass the order either way. However, it implies discretion to the Court which is not restricted to only two options but to adjourn simpliciter the application is also available. 11. The submissions of the learned Counsel that the verb "may" carries force of mandate. That it is to be read as "shall", cannot be accepted as to grant anticipatory bail or reject. It is a discretionary power of the Court and it cannot be restricted to only two options obliterating power to adjourn. Taking into account the practice of the Courts of granting interim protection, the said provision of power to grant interim bail is enacted by the State of Maharasthra. Thereby the said power is legally acknowledged. 12. It is the settled position of law that the use of word "may", which is an auxiliary verb will not prevent the Court from giving it the effect of mandate or obligation. However, it depends on the object of the statute. The word "may" in a statute would not by itself indicate that the provision is directory in nature. It involves discretion coupled with an obligation. Thus, the word "may" whether to be read as "shall", depends on the intention of the Legislature and it is not to be taken that once the word "may" is used, it, per se, would be directory. 13. The power of anticipatory bail being an extraordinary power, vests with the higher judiciary. It is to be carefully used as the Court has to achieve balance between the protection of the liberty of an individual and the effective and unhampered investigation by the State machinery. Therefore, though in many cases, bail is said to be a rule, anticipatory bail cannot be a rule but it is left to the cautious, judicious discretion by the judge depending on the facts of each case. Undoubtedly it is a duty of the criminal Court to uphold and vindicate the liberty of an individual and prevent unwarranted arrest. Hence, adjourning matter without passing any order of granting interim bail will deliberately cause prejudice to the accused. However, the order adjourning matter after passing the interim bail in favour of the accused may give setback to the investigating machinery to collect evidence and will push the victim and witnesses into a fearful trauma. There are crimes which go unreported only because the citizens do not feel safe and assured to come forward and give complaint as they have apprehension that the accused will go scotfree or will be protected under law. On the other hand wherein rejection of the anticipatory bail is forthwith, it may prejudice or be unjust to the accused. Thus, when a case cannot be classified as black and white but there is a grey area or borderline case which needs some time for a Judge to get the correct picture, though prima facie, to decide fairly the application for prearrest bail. 14. It was strenuously argued that proviso supports the submissions made by the learned Counsel. It is not a rider but a clarification. It is true that the proviso in fact clarifies the issue before this Court by confirming interpretation that the Court may simply adjourn the application neither rejecting nor granting interim order. Proviso to section 438(1) is truly a crux of the matter. It answers the point raised by the learned Counsel. The Law Commission in its 203rd report, in clause No.6.1.10 has stated that the proviso is explanatory and it explains that if the anticipatory bail is rejected and no interim order is passed, then it shall be open to an officer in charge of the police station to arrest the applicant without warrant. It is further clarified that it is not mandatory. The word "shall" used in the proviso is not a mandate expressed by the legislation that it is binding on the police officer to arrest. The police may not arrest the person if they really don't need it. 15. The said proviso, if carefully read, lays down two situations - (i) if the Court has not passed any interim order under this subsection, then the police can arrest; (ii) if anticipatory bail is rejected, then the police can arrest. These two clauses are joined with conjecture "or". The Legislature has not used the word "and". Had the word "and" been used, then that would have been only one situation. That means not granting interim order should have been necessarily followed by rejection of anticipatory bail. Therefore, the word "or" is very significant, deliberate, meaningful, and it indicates undoubtedly the two situations. If anticipatory bail is rejected, then, the police has no bar in arresting the applicant. However, when the Court has not passed any interim order, then also police under that circumstance, can arrest the accused. Thus, not granting interim bail is an independent circumstance. Thus, denial of an interim relief without any order of rejection of the application is unconnected circumstance other than the rejection of bail. Thus, refusal to grant interim order does not necessarily entail a rejection. Hence there may not be a rejection and interim bail is not granted; in that situation also, the police can arrest the applicant/accused. 16. It was submitted that how long such adjournments can be granted and how long the applicant/accused be kept waiting for justice. Uncertainty is a greatest vice in the process of justice. An application of pre-arrest bail cannot be kept pending for a long time. At the earliest a decision in the matter is required; either he is protected or his application is rejected informed to him. Thus, having the third option open i.e., to simply adjourn a matter without passing any order in an Anticipatory Bail Application though is very much available to a judge such application is not to be adjourned for long time if no interim relief is granted. It is expected that it is to be expeditiously decided and, therefore, as a matter of prudence, the matter can be adjourned for final disposal without giving interim protection at the most for 2 to 3 days. 17. I am aware that not to grant interim bail will compel the applicant to to hide from the police during that period till his matter is decided finally. However, we cannot ignore the ground realities that when the application for anticipatory bail is made, the said accused does not remain present in the Court unless he is given interim protection and he is not available to the police. Under such circumstances, interpreting the provision of section 438(1) that by way of amendment, the Court has no power to adjourn the matter but to pass orders only either to grant or reject, is not the correct interpretation. 18. In Civil Procedure Code, under Order 17 there is a specific provision for adjournment. Similarly, in Chapter XXIV of the Criminal Procedure Code, which pertains to "General Provisions as to Inquiries and Trials", section 309 is about power to postpone or adjourn every inquiry or trial but it is to be heard expeditiously. Section 309(2) empowers the Court to postpone or adjourn any enquiry from time to time for reasons to be recorded. 19. In State of Maharashtra v. Kachrusingh Santaramsingh (supra), in paragraph 6 therein, it was held that as per sub-section (1), the Court may either reject the application forthwith or issue an order for grant of anticipatory bail and in circumstances which may exist when it may not be possible for the Court to arrive at such a decision forthwith, then in such cases, it might become necessary to adjourn the hearing of the case to some future date. The three contingencies are laid down either in the form of grant of anticipatory bail; rejection of anticipatory bail and interim order of protection. However, it does not say specifically that Court has no power to adjourn it without passing any order. Hence, it is distinguishable. "3. This Court has already taken a view that if the learned Sessions Judge is not inclined to grant ad-interim relief pending the application for anticipatory bail, the proper course will be to reject the application for anticipatory bail. This Court has already deprecated the practice of rejecting the prayer for ad-interim relief made in the application for anticipatory bail and keeping the main application for anticipatory bail pending." However, law is not discussed in respect of the bar on Court's power to adjourn without passing any order. The prosecutor has also not opposed the application. Therefore, it cannot be said that the ratio is laid down in the said judgment. 21. In the case of Rais Shaikh v. The State of Maharashtra (supra), the learned Single Judge of this Court (Coram: Roshan Dalvi, J.) has relied on the judgment in the case of Pradeep Pushpankant Goragandhi v. State of Maharashtra (supra) and while disposing of the Anticipatory Bail Application, gave interim relief to the applicant and directed the applicant to appear before the concerned Court. 22. In Sandeep Sabarwal v. The State of Maharashtra (supra), a learned Single Judge of this Court (Coram: R.P. Sondurbaldota, J.) disposed of the application on the statement of the Prosecutor that the applicant will not be arrested till the matter was disposed of by the Sessions Court. "4. Section 438 of the Criminal Procedure Code makes a provision for grant of bail in anticipation of arrest for non-bailable offence by the High Court or the Court of Sessions. The Court may, after taking into consideration, the nature and gravity of the accusation, the antecedents of the applicant, the possibility of the applicant to flee from justice, and where the accusation has been made with the object of injuring or humiliating the applicant by having him so arrested, that Court may, either reject the application or grant anticipatory bail. It may also pass interim order for grant of anticipatory bail with certain conditions. Once, anticipatory bail is granted such person on being arrested has to be released on bail." 24. In the case of Ashok Jairam Bhojane v. State of Maharashtra (supra), this Court (Coram: A.P. Bhangale, J.) had canceled the anticipatory bail granted to the accused/respondent Nos.2 to 4 therein, as the ad-interim anticipatory bail was granted to the accused without hearing Public Prosecutor and then confirmed accordingly. 25. Thus, these judgments are distinguishable as this issue was not discussed. With this, I conclude that a Judge may either pass interim order or may reject the application forthwith or may adjourn the matter only for a short period without passing any order. In the present matter, the application for final hearing is pending and it is fixed on 9th May, 2014 before the Sessions Court. I have already granted interim bail to the applicant/accused, till today. So it is extended by one day and the learned Sessions Judge is expected to decide the said application finally on 9th May, 2014. If the application is not decided on that day, the interim protection may be continued till final hearing of the said application. 26. In view of the above, the application is disposed of. 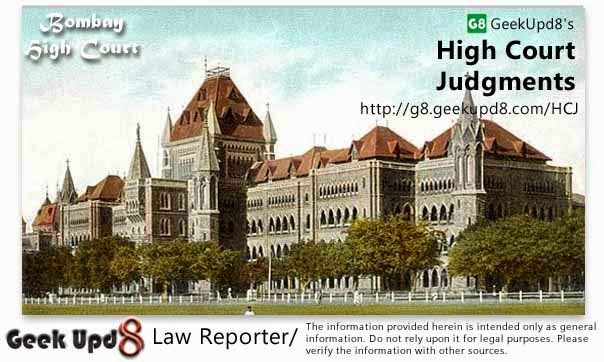 Geek Upd8 - Law Reporter: Whether Court can adjourn hearing on Anticipatory Bail application ? A. Criminal Procedure Code, 1973, Section 438 - Anticipatory bail -Interim bail - Grant of - Judge may either pass interim order or may dismiss the application forthwith or may adjourn it only for a short period without passing any order - Bail application fixed on 9-5-14 for final hearing - Interim bail granted to applicant/accused extended Sessions Judge to hear bail application finally on 9th May, 2014 - If bail application is not decided on that day, the interim protection may be continued till final hearing.